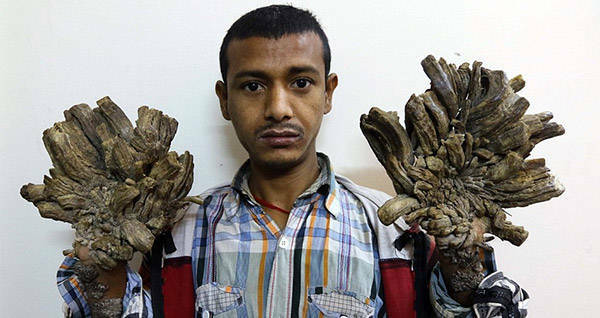 Epidermodysplasia Verruciformis is an extremely rare disease with an extremely bizarre symptom: the development of bark-like growths from the hands and feet. Epidermodysplasia verruciformis is a mouthful to say. But saying the name of this disease is much easier than having it. Epidermodysplasia verruciformis is a hereditary skin disorder. It’s extremely rare, but it’s associated with a high risk of skin cancer for those who do develop it. If a person contracts epidermodysplasia verruciformiswart they’ll probably develop wart-like lesions all over the body. The warts sometimes progress into long, bark-like tumors. Because of this, epidermodysplasia verruciformis is also called “tree man” syndrome. There are only 600 cases a year, and only a handful of the extreme tree-like cases exist. It’s so rare that Dr. Michael Chernofsky, the senior hand and microvascular surgeon at Hadassah Medical Center in Jerusalem, had never seen anything like it. That was, until a patient who had “tree man” syndrome unwrapped a cloth to reveal his hands to Chernofskyin in 2017. The patient was 42-year-old Muhammad Taluli. “I’ve seen some weird things, but not this,” Chernofsky said. Part of the reason epidermodysplasia verruciformiswart is uncommon has to do with the unique genetic combination people who develop it have. The disease stems from human papillomavirus (HPV). There are over 100 strains of HPV. But people who get epidermodysplasia verruciformiswart also have a genetic mutation which limits the immune system’s ability to handle the HPV. When that happens, the virus can spread and take over and create the tree-like growths. Aside from being physically painful, Taluli’s disease turned him into a recluse. He didn’t want to end up in a situation in which he’d have to show his hands to people. Even doctors who were scared of catching it wore double gloves and special masks when treating him. After undergoing surgery, Taluli was left with no skin on his hands. Doctors had to graft skin from other parts of his body to cover the scars, which looked like bad burn marks. 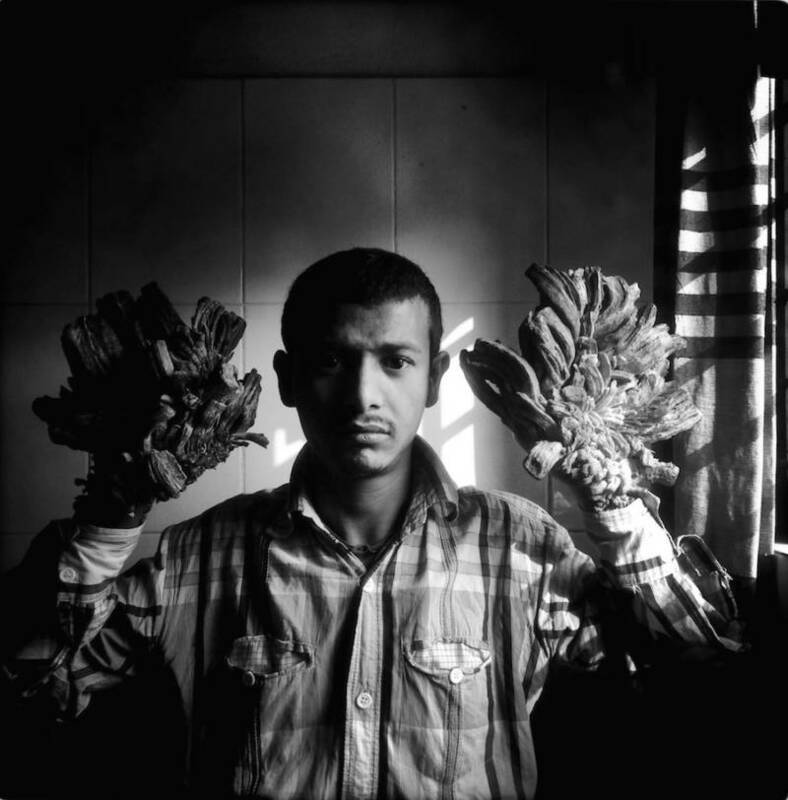 Another patient with the disease, Abul Bajandar, was dubbed the “tree man” in 2016. Bajandar is from Bangladesh and needed over 16 operations in 2016. In total, 11 pounds of growths were removed from his hands and feet. Before the operations, Bajandar was unable to hold his three-year-old daughter. He thought that he’d never be able to. Bajandar met his wife before he contracted epidermodysplasia verruciformiswart, but by the time they married the disease had taken control of him. Bajandar and his family practically lived in the hospital for a year, starting when he was first admitted. He became a loved and favorite patient amongst the hospital staff, as well as a minor celebrity by people who had heard about his condition. Like Taluli, Bajandar needed several surgeries after the removals in order to perfect the shape of his hands. However, he is expected to remain in good condition as long as the warts don’t grow back. There have been several treatment methods, but no definitive cures for epidermodysplasia verruciformiswart aka tree man disease, making early diagnosis the most important thing when it comes to this rare condition. If you found this story on “tree man” syndrome interesting, you may also want to read about cutaneous horn, the affliction that turns people into unicorns. Then if you feel like learning about another rare disorder, learn about cotard delusion, the disorder that makes you think you’re dead.